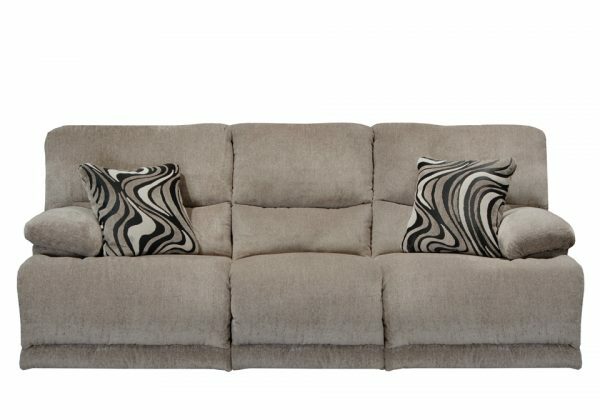 The Jules Reclining Loveseat by Catnapper features luxuriously soft chenille fabric, fashionable contrasting accent pillows, and a pewter finish. Dual-reclining contemporary design with steel seat box construction and comfort coil seating featuring Comfor-Gel. Its state-of-the-art frame and mechanism construction can hold up to whatever your family dishes out. *Image shown is the sofa, NOT the love seat. The Jules Reclining Living Room Collection by Catnapper features luxuriously soft chenille fabric, fashionable contrasting accent pillows, steel seat box construction and Comfort Coil Seating featuring Comfor-Gel. 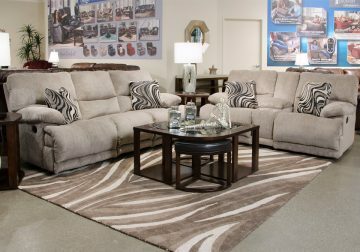 Frames, mechanisms, comfort coil cushions and springs are made from the finest materials. Its state-of-the-art frame and mechanism construction can hold up to whatever your family dishes out. The fabrics are wear-tested in the test’s lab before being Catnapper certified. Genuine Catnapper furniture stands the test of time and is crafted to the highest quality standards. Moreover, before its products are sent out the door, they’re real-life tested, because superior quality control is number one priority. For more information about Catnapper Furniture’s warranties, click HERE. Under these Limited Warranties, the sole liability of Catnapper Furniture is limited to repair, or at its option, replacement. Catnapper Furniture will pay, within one year from the date of purchase, reasonable and customary labor rates to repair or replace the defective parts and shipping costs from the retailer to and from Catnapper Furniture at no charge to the original retail purchaser. After one year from the date of purchase, the original retail purchaser will be responsible for labor, packing, and all shipping and transportation costs.